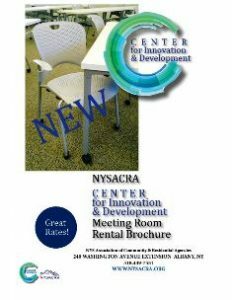 NYSACRA or the New York State Association of Community and Residential Agencies represents over 200 not-for-profit agencies that provide service to people with intellectual and a variety of other developmental disabilities. Founded in the seventies, the organization’s member agencies now has a combined workforce of more or less 70,000 employees that caters to the needs of persons with disabilities and their families residing in New York. The support and services provided by NYSACRA’s members range from educational to supervised residential living alternatives, family care, and even clinical services. Since its inception, NYSACRA’s advocacy has always been to protect the rights and address the needs and aspirations of persons with disabilities. The organization’s goal is to provide a strong, collective voice to its members at the local, federal, and state levels on matters relating to services, funding, and legislation, and be primary resource for information, and technical assistance as well as opportunities for collaboration, networking, and continuing education. NYSACRA’s education program include wide-ranging topics on health, wellness, and management. Members of NYSACRA converge regularly to address issues and the changing needs of its growing membership, share new information and best practices, and craft quality improvement strategies to ensure an ideal yet attainable service environment.